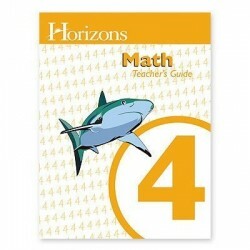 The resourceful Horizons 4th Grade Math Teacher's Guide includes: a daily lesson planner, duplication masters, answer keys, teaching tips, materials and supply lists, manipulation suggestions, a readiness evaluation test, and additional worksheets. The additional worksheet packet may also be purchased separately from the teacher's guide. The irreplaceable teacher's guide contains answers for Student Books 1 and 2.